Maybe we can sleep in I'll make you banana pancakes Pretend like it's the weekend now"
Isn't that song so adorable?! Dang! I guess I'm one day late for it though! :D It was pouring like crazy in Orange County yesterday and it was super chilly outside! In lieu of having banana pancakes with rain today, I had a tall stack of it along with clear sunshine. Hey, at least they were mini delicious pancakes. Oh my goodness were they light, fluffy, filling, and fun to eat! 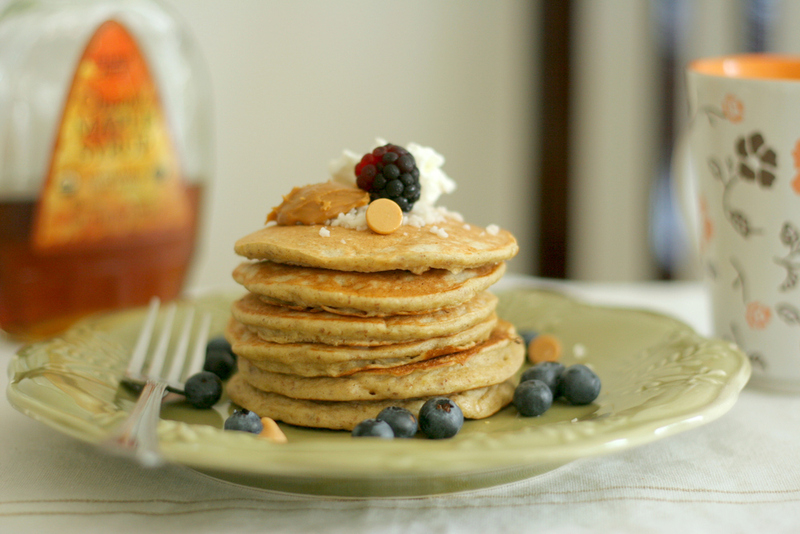 Once again I went back to Hodgson Mill's GF Flax pancake mix. I kind of like the ingredients they use in this mix! Although, I haven't used Sorghum flour before and I'm curious to give it a try sometime in the future. I love playing around with different flours and textures! This time around, instead of making it into pumpkin spice pancakes, I morphed them into banana pancakes because my homey Jack Johnson told me to. In the mix I put in half of a mashed banana, vanilla, milk, and 1 egg. Topped it with Biscoff Spread, Greek yogurt, pure maple syrup, and colorful berries. Then I threw some walnuts on top. Today Greg and I are going to work with the kids at the MAD (Making a Difference) club. Actually, it's more like a before-Christmas part-ayyy! We are bringing in some pizza and they will bring whatever snacks they want to share. Oy...I can prophesy that they will be bringing bags of Taquis, Cheetos, and who knows what else! Haha. We will also be finishing up the film The Lion, the Witch, and the Wardrobe and somehow tying it in to their relationship with God! Greg and I feel so immensely blessed because this group is so excited to learn and get their hands dirty. They are so outgoing and fearless to learn about everything (except math). Save the Dates are In! This is seriously the best I could do with my limited resources and skills! I actually have zero talent when it comes to computers; however, when I started to get more familiar with my blog and the little quirks it needs to have done for maintenance, computers became less intimidating for me. My lack of gifting in this area=the sudden disappearance of my profile picture on the blog page. I still can't get it to work haha. Help. I will be picking these up at Walmart today and I'm pretty excited about it! 1) Wide lat pulldowns- 55 lbs. I completed 5 sets for all of the exercises. It was an awesome heart pumping workout indeed. Afterward, I performed intervals on the treadmill for 15 minutes followed by 10 minutes of walking. Do you prefer rain or sun? -I'm usually more of a rain person, but the sun is slowly growing on me! As long as it's breezy. Which of these exercises do you/would you find the most challenging?